For for the Game Boy game, see Mega Man IV. 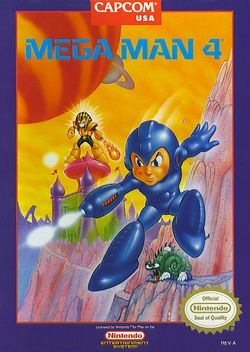 Mega Man 4, known as Rockman 4: A New Ambition!! (ロックマン 4 新たなる野望! !, Rokkuman Foo Arata Naru Yaboo!!?) (also translated as New Evil Ambition or New Treachery) in Japan, is the fourth game in the Mega Man series. Many years after its initial debut the game was re-released in Japan for the PlayStation as part of the Rockman Complete Works series. Later, the game was bundled in Mega Man Anniversary Collection along with the entire original series. The PlayStation re-release features improved graphics, additional controls, and unlockable parts that you can swap in and out to upgrade Mega Man with. "AD 200x: household robots Rock and Roll were created by master robot designer, Dr. Light, and were enjoying their peaceful days. Then one day, the industrial robots all over the world went on a rampage and the world fell into total chaos. Dr. Light quickly realized that mad scientist, Dr. Wily, was behind the nefarious deed but he didn't know what to do. Rock, having a strong sense of justice, volunteered to be converted into a fighting robot. Thus the super robot Mega Man was born. Mega Man shattered Dr. Wily's plans three times and world peace has been maintained so far... But history repeats itself. Dr. Cossack, a mysterious scientist, has invented eight powerful robots and sent them after Mega Man. Mega Man starts for the battle again, this time equipped with the powerful new Mega Buster!!" This page was last edited on 28 February 2016, at 17:47. This page has been accessed 45,588 times.